The layout depends on how the three elements of a bathroom are placed within- the wash basin, the toilet/water closet and the shower/bath-tub. 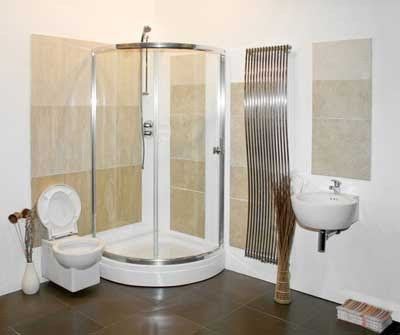 One-wall baths have the toilet, basin, and combination shower/tub plumbing aligned along one wall, making for a relatively long, narrow bathroom. One-wall layouts are often used where the simplest solution is to cut off the "end" of a long room and dedicate it to bath fixtures. You may find extra fixtures, such as a bidet, a separate tub, and a separate shower in a one-wall bath, but it's not common. 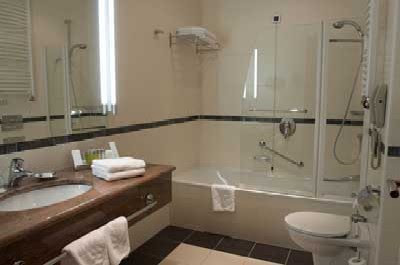 Two-wall baths usually have the toilet and basin on one wall and the shower/tub combo (or separate shower and tub) on the other. You might also find the toilet on one wall and the shower/tub and the sink on the other, depending on the length of each wall. A two-wall layout offers a desirable sense of enclosure, but care must be taken to ensure that fixtures are placed far enough from each other and from the door for safety and comfortable use. 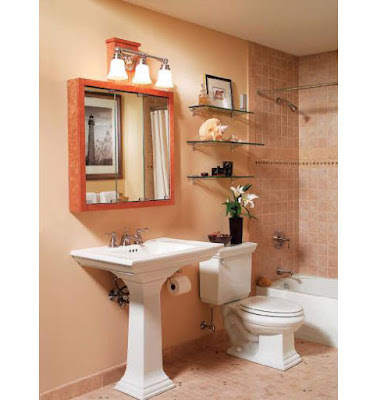 A three-wall layout, with the toilet on one wall, basin on another, and combination shower/tub on the third, is a space-conserving solution that can put every fixture within a step of the others. It is also the layout usually used in a master bath with numerous extra fixtures such as a bidet, more than one basin, and a separate tub and shower. If you have to remodel your bath in the future and want to install a number of new upgrades, a room that is already plumbed in the three-wall layout may be the easiest to work with. You can't turn a standard tub into a jacuzzi for four or make a gravity-assist toilet work like a pressure-assist model, but you can find fixtures that mimic the look of costlier designs. 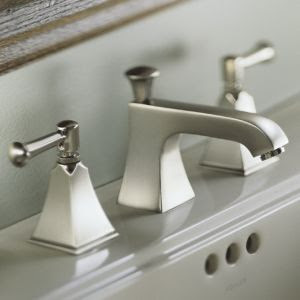 Traditionally styled fixtures and fittings are widely available at all price points, so look carefully at the high-priced models, and then seek out the more affordable looks in the same general style. Contemporary innovations, such as one-piece elongated-bowl toilets, are harder to replicate at modest prices, but you can skimp elsewhere if you can't do without them. Marble/Granite slabs are the top-of-the-line choice, but as with diamonds, it's finding one large, intact piece that's so costly. 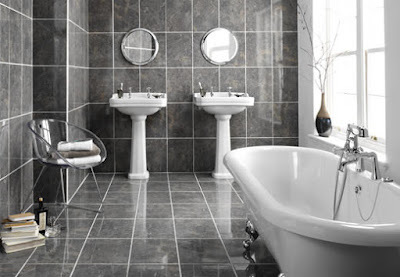 You can get the same look for less if you opt for large marble tiles set flush to each other. For even less, you can choose "cultured" marble, which is marble dust bonded into a solid slab, or, for still less, select a laminate countertop with a faux- marble pattern. Handmade, custom-colored, imported ceramic wall tiles. If they're too costly to use throughout the wall, use them in tile borders and accents. Choose a compatible plain tile for most of the installation, and save the custom pieces for eye- level areas such as the backsplash or a border around a window. Marble flooring may be out of reach, but ceramic tiles with a faux-marble look or handsome vinyl flooring are good-looking, affordable alternatives. 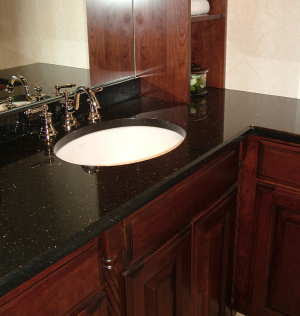 Many vanity and storage cabinets come in such a wide array of stock sizes and shapes that they assure a virtually custom fit, so use stock/modular cabinets wherever you can. 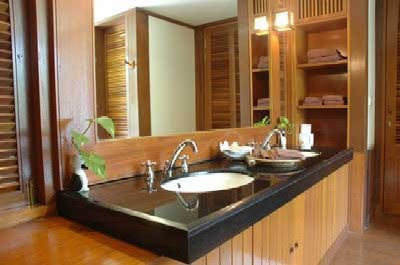 If your budget says irul or anjili but your heart says teak or mahogany, you may prefer to paint rather than stain your cabinets to disguise the more prominent grains of the lower-cost woods. 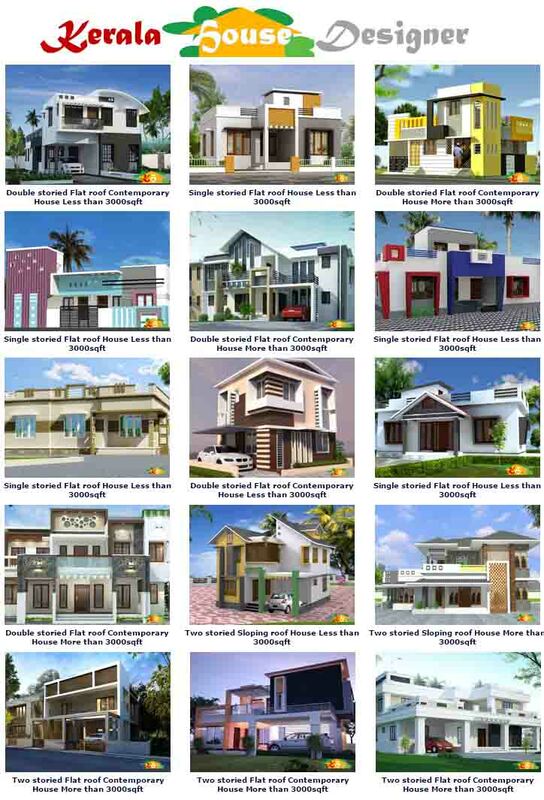 Bottom line: Whatever the look you like, you can probably find similar looks within your budget.